Nannoplanktons obtained from sixty-two core samples taken from twenty-three holes penetrated in the Southern part of Black Sea were investigated in this work. Twelve species belonging to the Emiliania huxleyi zone (NN 21-Holocene) were determined. Emiliania huxleyi (Lohmann) came into existence in Black Sea three thousand years ago and is very abundant in these sediments. This study clearly showed that uranium concentration increases with increasing nannoplankton content of the sediments. It is also observed that the uranium oxide (U3O8 ) contents of the Emiliania huxleyi (Lohmann) accumulations on the abyssal plains are higher than those other sediments in the same environments. Karadeniz'in güney bölgesindeki 23 durak noktasında elde edilen karotlardan ahnan 62 örnekte Nannoplankton'- lar incelendi. Örneklerde Emiliania huxleyi zonuna ait (NN 21-Holosen) oniki Nannoplankton türü tanımlandı. Karadeniz'de 3000 yıl önce yaşamaya başlayan Emiliania huxleyi (Lehmann) türü sedimanlarda çok yaygın olarak bulunmaktadır. Yapılan incelemede Karadeniz çökellerindeki Nannoplankton'ların yoğun olduğu seviyelerde uranyum miktarının da arttığı saptandı. Alınan örneklerde, abisal düzlükte bulunan Emiliania huzleyi (Lehmann) yığışımlarındaki uranyum oksit (U3O8 ) miktarının diğer seviyelere göre yüksek olduğu belirlendi. Bukry, D., 1973, Coccolith stratigraphy, Eastern Equatorial Pacific, leg 16; Deep Sea Drilling Project, XVI, 653-711. Ellis, H.C., 1975, Calcareous nannofossil biostratigraphy, leg 31: Deep Sea Drilling Project, XXXI, 655-676. 1979, Neogene Nannoplankton zonation in Eastern Mediterranean: VII. Int. Cong. Mediterr. Neogene, 391-401. Gartner, S. Jr., 1977, Calcareous nannofossil biostratigraphy and revised zonation of the Pleistocene: Marine Micropal., 2, 1-25. Gedik, A.; Saltoğlu, T. and Kaplan, H., 1981. Karadeniz'in güncel çökelleri ve uranyum içerikleri: Maden Tetkik ve Arama Enst. Derg., 92, 97-119, Ankara. Howe, R.C., 1977, Calcareous nannofossils, leg 37. Deep Sea Drilling Project, XXXVII, 909-916. Raffi. I. and Rio, D., 1979, Calcareous nannofossil biostratigraphy of DSDP, leg 13; Riv. Ital. Pal., 85, 127-172. ISNAD TOKER, Vedia . "Nannoplankton and uranium concentration relations in the Black Sea Deposits". 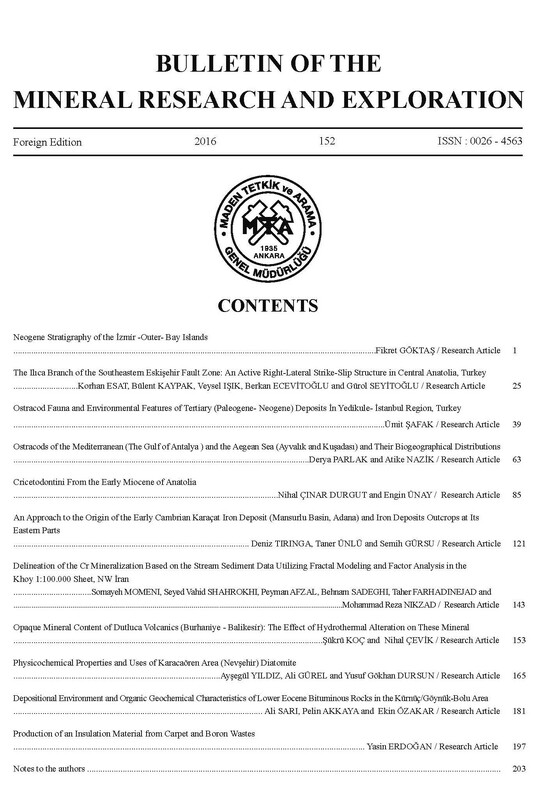 Bulletin of the Mineral Research and Exploration 99 / 99-100 (April 1983): 1-11.